Welcome to Real Life. One person can hold incredible influence. Darkness had fallen on Judah. Ahaz, their king, turned his back on God. He embraced the detestable practices and pagan idolatry of the surrounding nations… even to the point of sacrificing a son in the fire to Molech. Symbolic of the completeness of Ahaz’s apostasy, he boarded up the Lord’s temple. All of Judah followed Ahaz’s evil example. God will not bless a person or nation in their pursuit of evil. With God’s protection removed, the Assyrians attacked and overpowered Judah. They carried off plunder and captives. This should have been a wakeup call. Instead, Ahaz foolishly believed his enemy’s strength had come from their god. And so, he also began to worship the god of Assyria. Ahaz was blind to the fact that he was the cause of Judah’s downfall. Royal Seal of King Hezekiah recently excavated. Eventually, Ahaz died. His son, Hezekiah, was crowned king. As his first official act, Hezekiah re-opened the temple. This was Judah’s turning point—away from evil and back to the Lord. Then, King Hezekiah summoned the priests and Levites to Jerusalem. He asked them to consecrate themselves and the temple of the Lord. Next, the king called all of Judah to a sacred gathering at the temple. The nation dedicated themselves to seeking the Lord. They worshiped the Lord. They offered sacrifices for their sins. Light returned. Darkness fled. Everyone rejoiced at the change that the Lord had brought about so quickly. The Lord heard. He forgave. He healed his nation. Passover lasted seven days. There was such great joy in Jerusalem, no one wanted to leave. So, they celebrated for another seven days. King Hezekiah footed the bill. As I read this account, I considered the mystery of God’s sovereignty and man’s will. Why had Ahaz embraced evil and his son good? Certainly, apart from the work of God’s Spirit, not one of us would seek the Lord. Why do some listen while others refuse? Give me a heart, dear Lord, that listens. Our God is a God of hope. Our nation is in the midst of a scary election. Many fear the future. Though dark days may come, God is able to bring change quickly. Hezekiah wholeheartedly embraced God and good. The people wholeheartedly joined him. The result was great joy! Lord Jesus, I am one small person. I hold no position of power. Yet, each of us holds some influence. You multiply the desire of one heart wholly dedicated to seeking you. Give me that kind of a heart, dear Lord! May the Lord, who is good, pardon everyone who sets his heart on seeking God. Image: Dr. Eilat Mazar; photo by Ouria Tadmor. 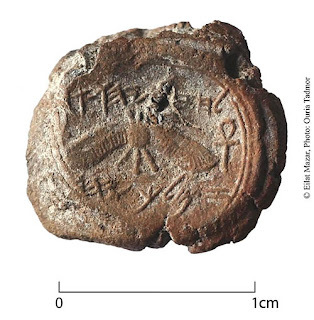 From article "King Hezekiah in the Bible: Royal Seal of Hezekiah Comes to Light"; read entire article at Biblical Archaeology.org. Note to my readers: Thank you for visiting Real Life. I apologize that I have not posted much lately. I am in the midst of a book project. I appreciate for your patience! Thanks so much for letting me know. I pray God's blessing over your work!